Harn is still very much alive although still afflicted by Harntime. A in-joke among Harn fans about the length of time it between releases. Both companies charge a premium price and to the Harn fan are worth every penny. I never been disappointed with the quality of a Harn release. Not sure when I will get to use an article on sealing and the type of Harnic Seals but just as much care and research was lavished on that article as it was on the recent Rethem Kingdom article. 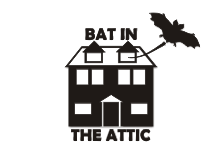 An absolute gem is Lythia.com There are dozens of free to download files, the harn forum, and a page with links to many different harn sites. Understand that whether from Columbia Games, Kelestia or Lythia all the different harn material are set during the same time. Namely the year 720 TR. This hasn't changed since the original release. The effect is that everything works together starting with the original Harn release in 1982. As for the difference between Kelestia and Columbia Games, This was born of a split between the original Harn author N. Robin Crossby and the owners of Columbia Games. The reason are complex and many issues unresolved to this day. But both have avoided stomping on each other toes for the most part and through their separate efforts managed to effectively expand the Harn corpus. As for who is in the right. My recommendation is to ignore it and buy from both. While Columbia continues to expand Harn proper, Kelestia focues more on Lythia the mainland continent and has some really good stuff like Venarive. Venarive finally gives a complete set of weather tables to handle all the different climates. I know Dwayne and Tim are excited to hear about that. Kelestia also has started a series of articles fleshing out the mainland in the same detail as Columbia does with the Harn kingdom articles. The combined efforts of both companies and the fans have produce a very rich and detailed low fantasy environment. Plus series like Harn Pottage and Friends, Foes, and Followers are easily usable in other Fantasy RPGs. A lot of the Majestic Wilderlands was inspired by the Harn and I am active fan to this day. My complete collection of Harn Material stemming back to the original release in 1983. This is shows how much material is in the purple Kaldor binder. Kaldor is one of the kingdoms on Harn. Flipped open to the article on the city of Tashal the royal capital of Kaldor and it's largest city. You can see the clarity of the different buildings as they are drawn as simple black outlines with a white solid fill. You could expand a building using a scanner or photocopies and use as the start point for your building map. Not show is the backside of that map which is black and white and designed to be photocopied for the players to make notes on. There been a lot of talk over the new advantage/disadvantage system in D&D Next where instead bonuses you get to take the best of two rolls for an advantage and the worst of two rolls for disadvantages. With an advantage you are looking for best of two results. To figure out your odds you need to multiply the chance of FAILURE together to find out the new chance of failure. For example if you need 11+ to hit rolling two dice and taking the best means instead of a 50% of failing you have only a 25% chance of failing (.5 times .5). For a disadvantage where you take the worst of two dice roll you need to multiply the chances of SUCCESS to find out the new odds. For example if you need a 11+ to hit your chance success drops from 50% to 25% (.5 time .5). The general rule of thumb that in the mid range of the d20 (from success on a 9+ to 12+) advantage grant roughly a equivalent to a +5 bonus and disadvantage a -5 bonus. The increase and decrease in odds tappers off when your odds of success approach 1 or 20. For example a advantage on a 19+ your chance of success goes from 90% to 81% not quite a +2 bonus on a d20. A useful application of knowing the odds of rolling two dice is that you can just covert it to a straight bonus when rolling for a large number of NPCs. A bunch of goblins with an advantage from surprise that need 13+ to hit the players you can just apply a +4 (or +5 if you round up) bonus instead of rolling the second dice. This is because they have a 60% chance of failure on 13+. Taking .6 times .6 yields .36 a drop of 24%. Not quite a +5 bonus on a d20 dice. In short it is a clone of classic D&D. And Old School Renaissance will treat it as such. Mainly because it's adventures and settings promises to be compatible with the editions we do like and play. Promises to compatible to a far greater degree than 3.X, Pathfinder or 4.0 ever did. Just look at the Cave of Chaos adventure. Despite the differences in mechanics it works out about the same way you expect if you ran it with Mentzer rules. I created my own original adventure to use for the playtest and did everything the same I would preparing for Swords & Wizardry. And having run it 2 and a half times with three different groups it was nothing like the 3.5/4e games I played and a lot like the Swords & Wizardry/Majestic Wilderlands hybrid I use for my regular campaigns. The playtest is a clone and the Old School Renaissance will treat it as such. Ist success among the OSR will be the same as any similar high production value project. If it open to third party support, plays nice with the community, and produces good material using the format we had seen then it will have a slice of the OSR as customers. However what it will not do is supplant the love or the playing the classic editions. Because what newcomers forget time and time again is that the point is not to play something like the older editions but the older editions themselves. If you want to get customers among the OSR then your work needs to be useful to people playing and refereeing the older editions. I see by the comments I didn't get my point across. The Cave of Chaos adventure is almost as verbatim copy of the original and it uses ONE line stats blocks that are useful in actual play. If this format continues to be used this means that it is highly likely that D&D Adventures, Settings, and maybe supplements would be of some use to the OSR. Much in the same way that Swords and Wizardry gamers find material useful that was written for OSRIC. The public playtest is out and slowly getting out there as Wizard's servers are being hammered. I will be writing more about my experience with this version and the previous closed playtest version. But in this post I want touch on what I feel is D&D Next Characteristic. One of the first things I checked is to see if the same progression from the closed playtest is still there for the characters. Why? Because that is going be THE hallmark of D&D Next. The flattened power curve. A lot of people will nitpick on the at will spell abilities the Wizard will get and a dozen other details. But all that pale in the face that the power curve has flatten between characters, between levels, and monsters. This was thrown in my face when a friend and I decided to get a jump on an upcoming playtest test and try out D&D Next Combat. We made two characters with the closed playtest, which very quickly, and faced four orcs. Based on playing OD&D in the form of Swords & Wizardry I figure it would be a fair fight. It wasn't, the orcs slaughtered us. Granted we got bad rolls, but we still would have won the fight in OD&D. But with D&D Next we were dead, with two orcs left standing. D&D Next plays a lot like OD&D, very deadly and you need to keep on your toes to survive. But it doesn't do it in the same way as D&D does and for some that will be a deal breaker. but it is definitely D&D and not a game that just has the brand slapped on it. In my recent post about how my players handled the Demi-Lich of the Tomb of Horrors several people mention how did the dispel cause the demi-lich to be lost. My ruling came from the description of the Bag of Holding in ADnD's DMG on page 138. If overloaded, or sharp objects are placed within so as to pierce it, the bag will rupture and be ruined, and the contents will be lost forever in the vortices of nilspace. I ruled that the only way of causing the contents to be lost forever from OUTSIDE the bag was to dispel it. The party leaped on this as an effective way of dealing with whatever evil was in. Re-reading this also reminded me of why I ruled the Bag of Holding as an effective prison for the Demi-Lich. Even if the Demi-Lich had the power to force it way out of the bag, the bag would have ruptured and it would have been lost. In my last post, I told the story of how Dwayne of Gamer Closet, and Tim of Gothridge Manor literally bagged the Demi-Lich in the Tomb of Horror. To recap they manage to get into the final treasure room and saw the Demi-Lich skull, Dwayne emptied his bag of holding and the two crept into the room without disturbing anything. Dwayne then turned the bag upside down and held above the Demi-Lich, Tim then proceed to pick up some of the treasure. The Demi-Lich rose into the air right into the bag! At which Dwayne closed and tied it shut. Dwayne was playing Lord Divolic a Lawful Evil Myrmidon of Set, pretty much an evil paladin. Tim was playing Count Travlin a Neutral Evil fighter. Among their many schemes was sponsoring slaving raids. Where it interesting is that I was running another group at college and they messed with one of Divolic's slaving operations. With a Demi-Lich in the Bag of Holding, Divolic had his means of revenge. So he sent it to the characters of the college group. When they got they identified as a Bag of Holding, a particularly valuable magic item. They were mystified as to who sent it, the messenger didn't know either as Dwayne sent it anonymously. I bet there is a Demi-Lich in there. Now understand that at this time there was absolutely no connection between the two groups aside from me. And I played everything close to the vest as I prided myself on being a fair referee. I nearly let the cat out of the bag on hearing this. However I remained calm and kept my poker face. The remark was laughed at and then the party moved on to checking out the bag. The paladin strongly felt it was too good to be true and while they were not aware of Divolic in particular they had made several powerful enemies including various run ins with the Red Box Bargle*. So the Paladin did a Detect Evil on the bag. Which showed him that there was a powerful evil entity associated with the bag. ** Sadden and not willing to take the chance, the party then had the Bag dispelled. Next year, Dwayne came to my college and joined the group. When he heard about the Bag of Holding everybody laughed and had a good time telling the entire story. The guy who uttered "I bet there is a Demi-Lich in there" laughed the hardest. *I used the dungeon in the Red Box to start off the college campaign which of course have Bargle in it. Bargle manage to escape the party then two adventure later made a reappearance and escape again. The party's conflict with Bargle soon became an epic struggle in of itself. Including personal attacks on individual characters of the party. Bargle demise was the first major accomplishment of the campaign. **I ruled that the bag is connected to the outer world through the bag opening even when closed. Thus detection spells including Detect Evil would work. Note the Demi-Lich doesn't have any physical or magical abilities that would allow to escape from the bag. And the Tomb of Horrors gave specific conditions on when it was activated which allow the opportunity to use the bag in the first place. In this post Brendan talks about Persistent Campaign Settings. This is part 3 on commenting and answering the questions he poises. Now to answer some of Brendan's specific questions. Do any of you have a setting that keeps developing as specified above? If so, did you start with a published setting, or did you start from scratch? The Majestic Wilderlands started out using the Wilderlands of High Fantasy. 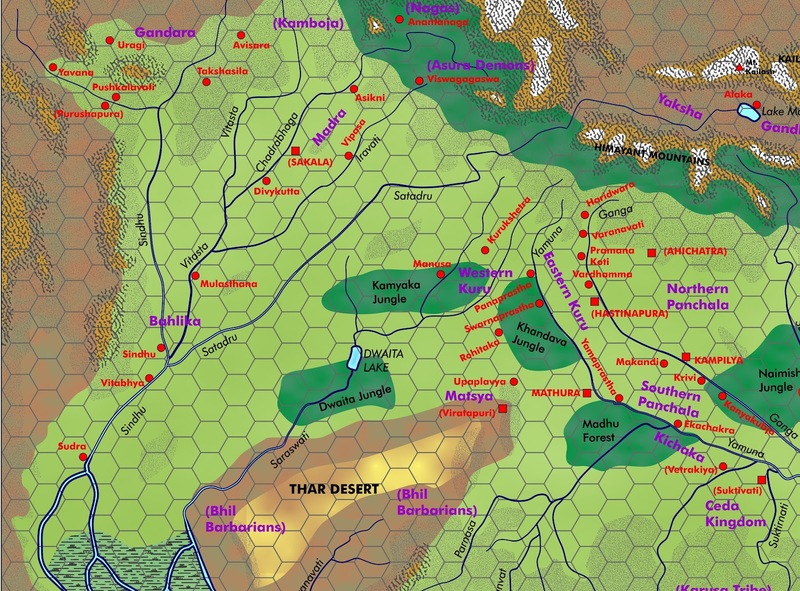 The original Wilderlands were devoid of any high level campaign detail. It was all local level detail leaving it to the referee to craft the broad overview. In this it shared the same design as the Spinward Marches of Traveller. How many campaigns or groups has your setting supported? I would say a dozen groups, with one group in particular (centered around Tim and Dwayne) having more impact than any others. Have you progressed through multiple historical or technological eras? No, although Time Travel is a staple of my games and as fan of Time Travel stories and Alternate History I have several techniques that I use to make sure what the players do seem part of the normal history. These techniques revolve around the fact that history rarely records all the details of past events. I never ran a game set in the past although I considered it for one of my theme campaigns. What about multiple game systems? Yup main systems included (in order) AD&D 1st, Fantasy Hero, GURPS, and now Swords & Wizardry/MW Supplement. I ran one off games using Harnmaster, AD&D 2nd, D&D 3.0, and Basic Roleplaying. Have you ever "upgraded" (or downgraded)? No sure what is meant by this. Early on I changed some fundamentals of the Wilderlands that transformed it into the Majestic Wilderlands. I went from 5 miles per hex to 12.5 miles per hex and the original villages became towns and important castles and I added a lot more smaller settling around these. I was lucky to hit on the idea of having different fantasy settings in widely separated geographical regions early on which kept things fresh. Do you think the diversity of products available now makes such fidelity unrealistic? No is more of a lack of information about alternatives to published settings. Sure D&D and most fantasy RPGs had information about creating your own. But detailed advice on what to do was few and far between. So to the average referee using a published setting looked a lot less work than making up one of your own. The internet has changed all that and now there are several alternatives to choose from. I contend that in the long run using a persistent setting for a specific genre winds up being less work for the referee. It like any skill or body of knowledge the more time and experience you build up the easier it becomes. Published setting can be still be a useful starting point. The trick is picking one that can be expanded as one's interest and tastes changes. Are there any techniques that you use to record campaign developments? Basically it all boils down to keeping good notes. I been using the Keep by Nbos recently. Hope you find this series of post useful in running your own Persistent campaign. In this post Brendan talks about Persistent Campaign Settings. This is part 2 on commenting and answering the questions he poises. Another potential issue is that such a setting could become too important. That is, a referee might be more cautious with trying new things, and might also become more sensitive to players that don't take the setting seriously. One firm rule I established for myself is I will live with the consequences of the players action. I also tell the players that the inhabitants of the Majestic Wilderlands are every bit as "real" as they are. That they are not the first adventurers to trod it's soils nor will they be the last. That while they are free to try anything they want, I will be considering ALL the consequences of their actions and they should do so as well. That while the risk is great, players have had characters that fundamentally changed the course of the Majestic Wilderlands. And there were characters that met a ignoble demise. One thing I did to help make things more fair was run campaigns where players were all members of a particular group. One important campaign where where the players were all members of the city guards. You know those weeny fighters that get the tar beat out of them by adventurers every time they visit the city. Now the shoe was on the other foot and boy the players came through. From the Knight Killer Crossbow to the Alert Stick, they came up with a variety of methods where low level fighters could handle adventuring parties far more experienced than themselves. Now the city guard are not the punching bags as they used to be and the players have a lot more respect. As for players not taking things seriously, a lot of the Majestic Wilderlands is bog standard fantasy. Most of these players just wind up roleplaying themselves in the campaign. The only thing I insist on is that whatever happens is that they react as if they were really there and that they limit themselves to what their character would know. I rarely have trouble any players following these simple rules. Certain kinds of games seem like they would work better with this kind of setting than others. A designer would have to work hard not to make a fantasy RPG that wouldn't work with the Majestic Wilderlands. Generally RPGs that won't work with my campaign are those that are oriented to one specific setting. Even then if that setting assumption is close enough to the Majestic Wilderlands, like Harn and Harnmaster, then I can still use it. This is because of the long shadow of D&D and the fantasy tropes that it always had regardless of edition. 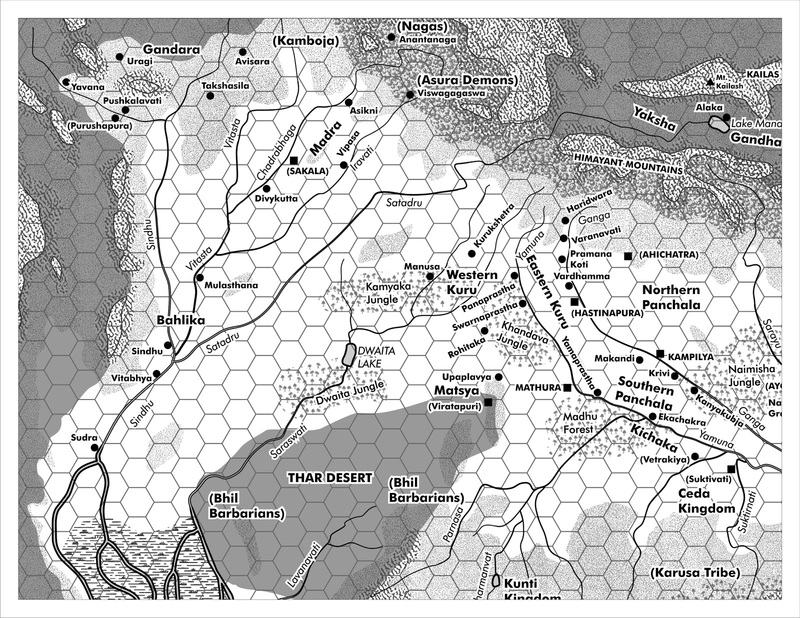 Since the Majestic Wilderlands still has D&D tropes at it's heart, it works with a large number of Fantasy RPGs. I ran it using AD&D 1st, Fantasy Hero, Harnmaster, GURPS, D&D 3.0, and now Swords & Wizardry/MW Supplement. 1) 90% of the time I ran a fantasy roleplaying campaign I set it in the Majestic Wilderlands. The lone exception is Harn. 2) Anytime I need something truly different than how I setup the City-State of the Invincible Overlord, I took one of the "blank" region on my wilderlands map and put it down there. They are far enough apart that it wasn't hard in coming up with a plausible reason for the regions to co-exist. The aspect of this that most intrigues me is how the remnants of one campaign (or group of players) could affecting other, future campaigns. 2) One player puts on the Evil Orb, Crown, Specter of Might and kills the Clerics of Set that were ruling Viridstan. The other players manage to zap him with the Chromatic Crystal and got the regalia off of him. But now the party was faced with a city in chaos. So they split the chromatic crystal into seven pieces and gave one to each character and then established the Council of Viridistan to rule the city. 3) A campaign using Swords and Wizardry revolves around the adventures of a Half-Viridian Fighter, a Elven Mountebank, and Human Thothian Mage, results in the players rescuing one of the Viridian Councilors, a former PC now NPC named Cathwar, aiding Council in achieving a decisive victory in the nearly 20 year long civil war, and recovering the two missing pieces of the Chromatic Crystal. The campaign ended with two of the players choosing to sit on the council. This is an example of one of several sequences of how players effected the Majestic Wilderlands. The keys elements that made this work again is the willingness to go with whatever consequences that plausibly results from the players action, recording the highlights, and sticking to the same setting over a number of campaign. The RPGPundit has been working on his own retro-clone RPG called Arrows of Indra and there is a twist. This clone draws on the mythology of India specifically the Mahajanapada period. Along the usual material covered in an RPG he is detailing a fantasy India for referee to use. We talked and I agreed to provide the campaign map for him. Here is a sample of what to look forward too. This the greyscale version of the northeast corner of the map. Color version of the same map. It was lot of fun working on this. Not only was a new and interesting locale it was my first project involving using real landscape as the base. The first map was also the first full blown test of a new greyscale mapping style I am trying by using fills and textures for vegetation and mountains so I can overlap the two seamlessly and clearly. Encouraged by the surprise success sales of G1 Steading of the Hill Giant Chief, G2 Glacial Rift of the Frost Giant Jarl and G3 Hall of the Fire Giant King along with the blockbuster movie Clash of the Giants, Gygax calls the staff of TSR into his office. From now on AD&D is going to be about fighting Giants. For the next two years a flurry of adventures was released. All of them about fighting giants including the classic Under The Storm Giant's Castle. 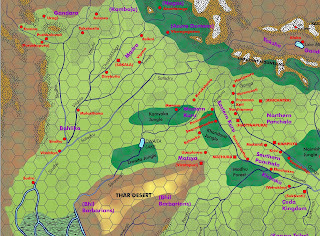 Greyhawk was shelved in favor of a new setting which had as it's centerpiece a war against the giants. Unearthed Giants was quickly written and released giving new classes and new races revolving around fighting Giants. However what seemed like a surefire way to capitalize on D&D's popularity and the excitement over the new Advanced Dungeons & Dragons was it death knell. Within two years of it's release, sales plummeted as gamers tired of fighting giants all the time and flocked other games like Chaosium's Runequest and SPI's newly released Dragonquest. There is growing excitement over Palladium Fantasy as many say it restores the wide ranging fantasy enjoyed by fans of original Dungeon & Dragons. Now a 2nd Edition of AD&D is has been announced that promises to be a toolkit to allow referees to create any fantasy setting they desire. 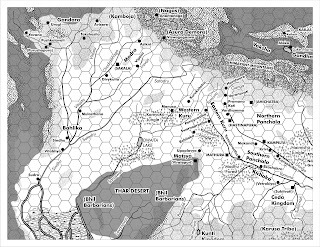 TSR is quick to note that fans of the Giant Wars will still find support in the 2nd Edition. Another worthy Kickstarter campaign has come up. Cityographer made by the same people who brought Hexographer. This would be especially useful for wide ranging sandbox campaigns where the characters are constantly visiting new settlements. Throughout last years the OSR has seen several print zines being established including Christian’s excellent Loviatar. This month my friend, Tim of Gothridge Manor, decided to release one of his own, The Manor. Obviously I am bit biased although in practice we rarely cut each other any slack. Something I only discovered in the past years was how much I like reading Tim’s material. I read a lot and some books I find an easy read and some are boring. Tim’s writing has always been an easy read and Manor #1 is no different. The first article in the Manor is the The Salt Pit. It is a little different in that is mostly vertical adventure. It makes for a good side adventure as the players adventure through the landscape. It also shows off one of Tim’s strength which is his ability to create interesting NPCs. Jason Sholtis contributes one of his numerous, and excellent, random tables. There something shiny in that Troglodyte’s Dung. It has some immediate use for the Salt Pit adventure. And don’t forget you get to roll twice if your character rolls up his sleeves and digs in. Next is my favorite article, Rural Pennsylvania: The Ghoul House. Tim and his wife take drives in the countryside and have various photos of interesting places. Tim decided to use them as part of a series of articles. I was a bit skeptical at how well it will turn but Tim wrote an evocative adventure involving a lich and buried ghouls. Next is an article of 20 forest encounters and a table to go along with it. And last but not least is a article about a street vendoer named Oren and his boots. This include background on Oren and what sells and along with several adventures. It doesn't quite knock off Superman, Dark Knight, or Spiderman 2 but it definitely belongs with them. It also one of the most pure comic book movies I have seen in the superhero genre. The action is good, the characterizations are spot on and consistent with the preceding movies. Best off all everybody gets a chance to shine. It has funny moments, amazingly the Hulk has the best line, moments that make you go woah! and serious moments. I don't think the 3D adds anything so you won't lose out by seeing it in 2D. I think this will be an important movie for the superhero genre in that it brought some things that were missing in previous films. While this being the climax of Marvel's introduction comic book style continuity is important, it also much more action oriented than previous films. The superheroes feel more like well superheroes. During the Swords & Wizardry/Majestic Wilderlands campaign I ran for the past several years, my players (Dwayne, Tim, Rusty Battle Axe) and I decided that we didn't like the weird bumps that are in the regular XP charts. In addition I wanted to some up with a consistent set of charts that I could use in future books for new classes. To use them with existing classes note the XP required to reach second level and that the chart to use. There are charts for 2nd level at 1,500 xp, 1,750 xp, 2,000 xp, 2,250 xp, 2,500xp, 2,750 xp, and 3,000 xp. The charts also displays the total xp required to go from one level to the next. This also show the method to our madness in creating these. Hope you find some use for them.